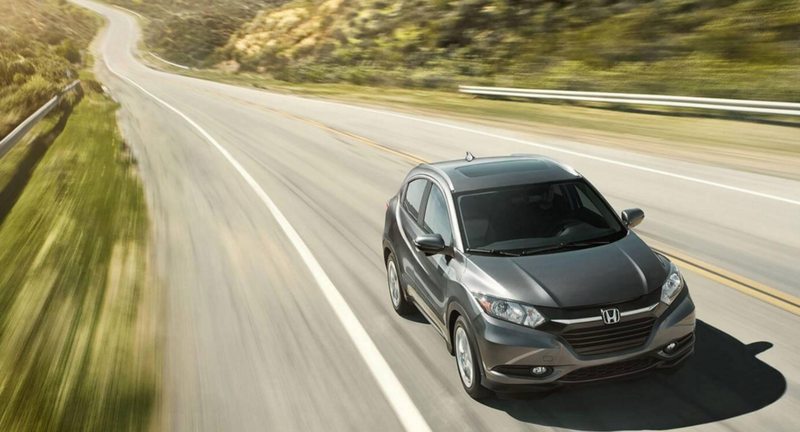 This system helps keep the HR-V’s handling and traction in control. On some of the rough roads you’ll find around Elgin, that’s a big advantage. When one of your tires is over or underinflated, this high-tech features lets you know. It reduces the risk of flats and blowouts. These long-lasting LED lights offer increased daytime visibility. The backup camera in the HR-V displays the view directly behind the vehicle, and guidelines let you know when you’ve backed up far enough. Standard on the EX trim level and above, the Honda Sensing system of active safety features shows Honda’s commitment to modern technology. Lane keeping assist will let you know if you’ve left your lane, and collision prevention braking will apply the brakes if an accident is imminent. On top of that, active cruise control with low-speed follow keeps the HR-V at a safe distance behind the vehicle in front of it. When it comes to your family’s safety, there’s no such thing as too much. The 2017 Honda HR-V showcases Honda’s commitment to modern safety features, and we’re excited to tell you all about it at Brilliance Honda of Crystal Lake. We’re located at 680 W. Terra Cotta Ave. in Crystal Lake, IL, just a short drive from anywhere in the Chicagoland area. Contact our sales department at 815-569-6400, or schedule a test drive online today!